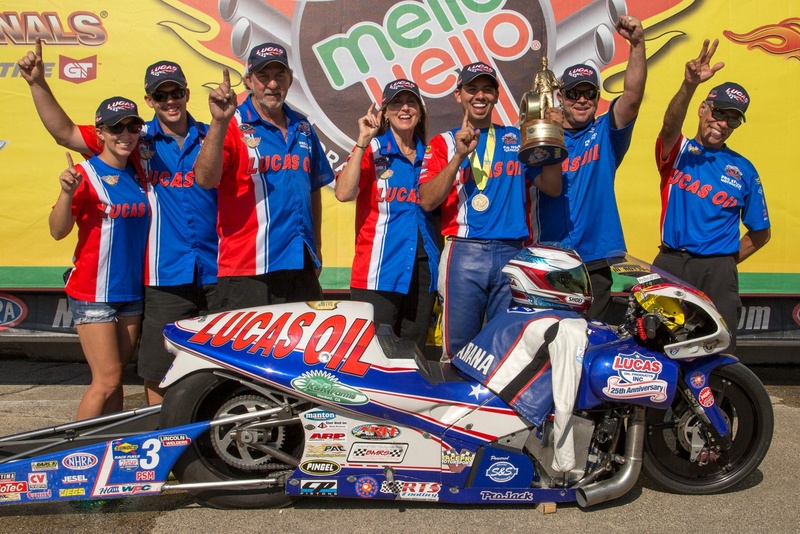 Hector Arana Jr. took his first victory of the season, bringing his Lucas Oil S&S-Powered Buell to a final round win over the Victory Gunner of Matt Smith at the Lucas Oil Nationals at Route 66 Raceway in Chicago, IL. The event also saw Chip Ellis continue his qualifying hot streak, taking the pole on the PiranaZ Buell for the second time in three races. Ellis set the quick lap of the event on his first hit, recording a 6.856 at 195.68 mph in the first session on Friday. In the next session defending series champ Andrew Hines came close with a 6.88 as Ellis blew a motor in the other lane. Saturday’s conditions were warm and moist, meaning the quick runs were over for qualifying. Still, Ellis ran a 6.92 after the motor swap, which was the quick lap of the third session, matched identically by Hines. A number of competitors opted not to run the final session as the soupy conditions meant improvement would be nearly impossible. Rain settled the issue after four pair ran and the field was set. Ellis has been on a tear in qualifying. Since Englishtown, he has placed no worse than second in the field, but the team has been hard on equipment and his motor-blowing Q2 run was a (harbinger? Is this a word?) of things to come. Sunday was hot and sunny and Ellis had a strong run of 6.90 in the first round of eliminations getting by Angie Smith. He ran a 6.91 in round a round two win over Angelle Sampey but blew the motor in the traps. Ellis was a no-show for his semifinal matchup with Matt Smith. 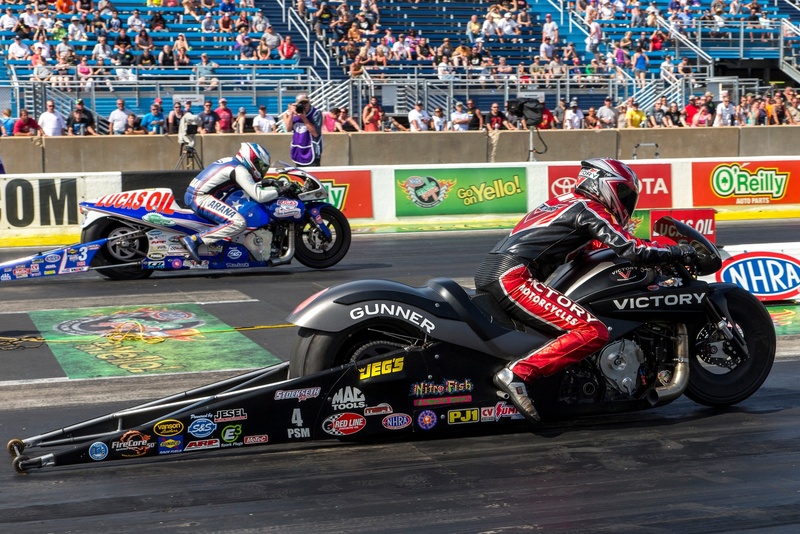 Smith, a former two-time series champ, is campaigning a two bike team with wife Angie featuring S&S-Powered Victory Gunners, took the single to make the final – his first final round appearance since Las Vegas last season. On the other side of the ladder Arana Jr. came out of the sixth qualifying position to beat former champ LE Tonglet in round one, got a holeshot win over the currently very hot Suzuki of Jerry Savoie in round two and then got by a redlighting Chaz Kennedy in the semifinal to make his 16th final round appearance. Matt Smith got the holeshot in the final but Arana Jr. drove around him 6.91 to 6.95 to take his second straight win at Chicago. The win was Arana Jr.’s tenth of his career and puts him in second place in the Mello Yello championship points behind Eddie Krawiec.